To some people racist's are arrogant, irritating, and damn right annoying to be around. Whilst to other people racist's are so intriguing to watch, they're willing to at least stick one of them into this 110 minute movie made in 2008. It was Directed by Neil LaBute; and Starred: Samuel L. Jackson, Patrick Wilson, with Kerry Washington. Now when me an my blushing bride first moved into our new house, together, deep down inside me I honestly thought to myself that everything was going to be alright. But no. It with great regret that I was very wrong, my friends. Damn wrong. All because our new neighbor, Abel Turner (Samuel L Jackson), takes a instant disliking to us, and at every given turn begins to rub us up the wrong way. Yeah. I'm not being paranoid about this situation. First he sneakily keeps on shining a spotlight through our bedroom window during the night. Then he keeps on speaking to me in hushed and intimidating tones when no one is around us. And to top it all off, he shames me and my wife Lisa (Kerry Washington) whilst we're throwing a house-warming party in our new home. I'm mean, for Christ sake, what is Abel's problem? Doesn't he like me and Lisa because I'm a white man and she's a black woman? And if that is the case, why should he care? Especially since he himself is a Nubian officer of the law! Oh! I don't know what's going on. But then again that's most probably why what next transpires all kicks off when Lisa says to me, 'Chris (Patrick Wilson Wilson). Your going to be a Daddy'. As Able take a break from his game - a short hiatus quickly turns into a period of shame - a bachelor party gives everyone a fright - and at the end of the day, a policeman's plan ends in one hell of a fight. 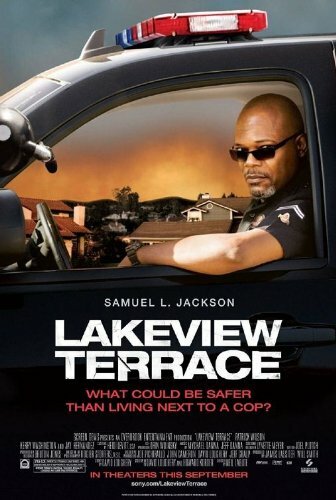 When I first sat down and watched 'Lakeview Terrace', nigh on straight away it reminded me of two different forms of entertainment I can remember from my not so distant past. The first thing this film reminded me of was the Paul McCartney and Stevie Wonder song, ‘Ebony and Ivory’, largely due to the way they canceled each other out in both tone and in temperament. Whilst the second thing it reminded me of was an old nineteen-seventies British Sitcom called, ‘Love thy Neighbor'. Now if you've never heard of this jovial series before, I best tell you that it was a rather light heated yet bigoted account, of what could happen when a nice West Indian couple move next door to a white working class family. I'm sure you know the sort of TV program I'm talking about, folks. Racial slurs run rampant whilst either side of the equation got to know each other in the process. OK. I have to admit. 'Neighbor' and 'Lakeview' don't play out in the same way at all. The production values and acting styles are far superior in this picture, plus their is an added feeling of dread and suspense it carries along with it as well. However, what they do share is a conceit that touches upon the whole 'racial dilemma', whilst segwaying into what is at the very heart of this movie -- envy -- and what one man will do no matter how wrong he truly is. You see, I presume Samuel L. Jackson’s character wants to be Patrick Wilson’s character. He is younger than he is. He is less jaded then he is. And on top of that, he has better prospects, a dazzling wife, and a fresh new beginning too. Whereas Samuel's character is lacking all of these things, whilst desperately trying his best to hold onto what he thinks is righteous and pertinent about his own outlook on life. Envy is the key that makes him act in the way he does. And this fact is highlighted during numerous scenes in this movie, most notably the bar-room scene where they both have a strained face off. Now apart from the message this film is trying to put across, what I like most about it was the manner that the story was told in. It doesn't try to compete with other such films which share a similar theme. Such as the racist aspects from 'Mississippi Burning' for example, or the stalking aspects from 'Cape Fear'. Instead, both of these aspects are transcribed in a much more docile manner, with the main antagonist almost seeming to be a ‘lost soul’ within the whole pretext. Wandering about in incremental stages, and making the final pay off at the end of the movie work very well for me -- almost as if it was a 'do or die' type of situation. As you've most probably gathered from my words I did like watching ‘Lakeview Terrace’. In many ways I look on it as an old nineteen seventies movie that it trying to highlight a very modern message. So, to re-phrase Paul and Stevie’s lyrics, ‘Can ebony and ivory live in perfect harmony?’. Or is this saying just for your bog standard usual movie going public? What do you say, Sam? Harmony? Or discord?